In At the Queen’s Command (the first installment in a new alternate history series designed to span a re-imagined American Revolution) Michael A. Stackpole strikes a careful balance between historical source material and fervent imagination. Stackpole’s book combines engaging characters, a palpable sense of place, and a strong sense of Georgian voice and mores to create a compelling alternate history that draws you in and leaves you eager for more. One of the great challenges in writing an alternate history is to strike a balance between recognizable history, and the central conceit that sets the story apart from accepted truth. Sometimes, as in Harry Turtledove’s How Few Remain , the conceit is a tiny difference which leads to significant divergence: a message that in reality was intercepted, gets to its intended destination and as a consequence the Confederacy wins the American Civil War. In other alternate histories, like Patricia C. Wrede’s Frontier Magic series, the known world is entirely re-imagined by introducing a pervasive fictional element (like magic). The more foundational the alternate history’s conceit, the harder it becomes to maintain consistency with both the facts and values of acknowledged history. Which is why At the Queen’s Command , which adds dragons, magic, and necromancy to a re-imagined Colonial America is so impressive. At the Queen’s Command follows Captain Owen Strake, a soldier in the Queen’s Own Wurm Guard. He has fought against the Tharyngians (read: the French) on the Auropan (read: European) continent, and now has been sent on a reconnaissance mission to the colonies in Mystria. He must win over the colonists, survey the frontier, and return to Norisle (read: England). Of course, the mission does not go as planned and the colonies are drawn into war with the Tharyngians on their frontier. The publisher makes it very plain on the book’s cover that the series is meant to re-imagine the American revolution, but Stackpole made a brilliant choice to set the first book during his world’s analog to the French and Indian War. 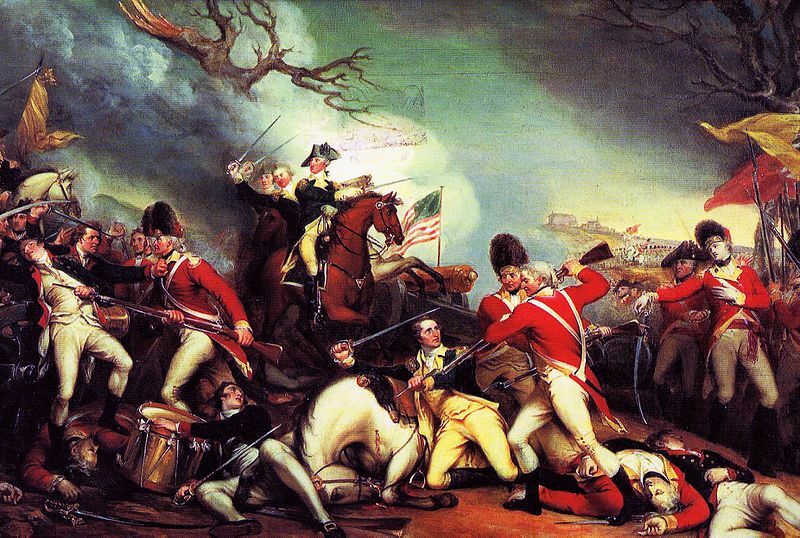 First, most readers are not going to be as familiar with that war as they would be with the American Revolution. If Stackpole had jumped right into historical events that most American readers are already acquainted with, he would have had a much harder time getting readers to accept his central conceit. By setting the book several years prior to the American Revolution, Stackpole has the opportunity to take more liberties with acknowledged history, draw the reader into his re-imagined world, and get reader investment in his characters. The characters are one of the strongest aspects of this book. This time period in real history is fraught with the consequences of history, a burgeoning streak of independence among the colonists, a sense of financial peril amongst the colonizers “back home”. Stackpole manages to capture the complex social, economical, political, military, and philosophical interactions of this time period through his well-realized characters. Whether it is through Owen Strake wrestling with his loyalty to Norisle, Prince Vladimir insisting upon the scientific method, Caleb Frost pushing for self-determination, the frontier trappers bridling at rumored taxes, Stackpole places a filter on Colonial America but still captures its colors. It is through these characters and their values that Stackpole addresses his themes, which are – in effect – the themes of John Locke, Thomas Paine and the other Enlightenment philosophers. The central conceit of this alternative world is the existence of magic. In Stackpole’s world, this is not a recent discovery but instead dates back to before the Romans. It has affected – to some extent – all technological and societal evolution that precedes the events of this book. For Owen Strake and the the other characters, magic is as much of a fact of life as breathing. While on the one hand this helps to ground the reader in the world, it also leads to one of the few moments that rings off true. Specifically, the magic of the colonies is wilder, less controlled, more free than the magic Owen Strake is familiar with. The narration supporting Strake’s initial explorations, especially the first introduction of the wendigo concept, are clumsy by comparison to the rest of the book’s smooth execution. In the hands of a lesser author, I would still consider them quite well done. However, once past the initial introduction, Stackpole’s seamless narration kicks in again and the book strengthens as it gathers pace. At the Queen’s Command is an excellent new entry in the field of alternate history. Like any good book, it offers no easy solutions at its conclusion. Partially, this is to set up tension for subsequent books in the series, but in a very real sense it is because we still wrestle with the same questions as Stackpole’s fictional Mystria: where does the state’s responsibility end, and where does the citizen’s begin? I am eagerly looking forward to seeing how Mystria and how Stackpole’s characters wrestle with these questions in the books to come.